Western Digital is basically a memory and storage play. As a result of the Fed's aggressive stance, here's a short idea among the semiconductors to consider now rather than something long. One would think that the horses have left the barn. Then again, have all the horses left the barn? Micron (MU - Get Report) guidance really surprised me. I guess I can be pretty thick sometimes, as Nvidia (NVDA - Get Report) guidance had also really surprised me. A trader has to know thyself well. My strength is in risk management. Thanks goodness. Sometimes I am better at pulling a rabbit from a hat than I am in choosing the hat itself. Both of these names, I came into earnings long the equity, but also to some degree fairly well hedged. In both cases, I continue to take further steps to try to erode net basis at least as quickly as the Federal Reserve and issues around both inventory and global trade erode share price. These two positions require a lot of my attention, but the risk as long as I pay attention to it every day...is bottled up. Gets me to thinking. A number of semiconductor type names will report in January, about a week after the banks kick off earnings season. Western Digital (WDC - Get Report) is basically a memory and storage play. Much like Micron in a way, with the exception that WDC's focus is on NAND memory, while MU is more DRAM oriented, at least as far as revenue drivers go. Intel (INTC - Get Report) , and Advanced Micro Devices (AMD - Get Report) will report the same week. I remain long Intel, and admit a certain bias in their favor. I am also undeniably a Lisa Su fan. If I were to look for a one month rental on the short side... is there enough room left to make money that way with Western Digital? Hmm. The first items I always look at when I study any stock are cash and debt levels. Both items, for this name have been in decline. The firm is not in any kind of danger of falling short of meeting their obligations, as Current and Quick ratios are still rather strong. That said, I really don't know how much one can trust Current Ratios across the chip sector these days given the issues that most firms are now having working through inventories. Margins are a big issue here too as average selling prices have been going the wrong way. That also puts the whammy on such metrics as Return on Assets and Return on Equity. I think I'm talking myself into a short position. Let's see if the charts tell us anything. For one, I am looking at this in the short(ish) term. Earnings will hit the tape after the closing bell on Thursday, January 24th. As we have started to see with the entire chip space, short term the performance of the share price will be reliant solely upon guidance. Past performance is just that...past performance. Here, on this roughly 10 week chart, I see upside Fibonacci resistance at 44. The declining upper trend line of the Pitchfork has also acted as an obstacle. Support may or may not arise closer to the central trend line on a sharp electronically driven selloff. The group is up today, and as you know, we like to sell on up days, and buy on down days, right, gang? 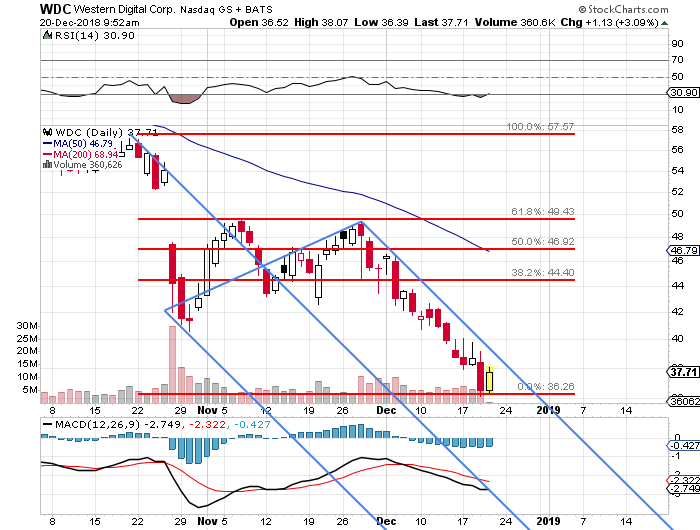 -Sell Short 100 shares of WDC at or close to the last sale of $38.17. What the option market positions do is limit the loss to the upside by January 25th to $583, by gaining the right to repurchase the shares at $44. How we subsidize that hedge is by selling the right to sell us the shares at $30 by that date, limiting to potential profit to $617. Like the name? For those traders who do think that WDC is way oversold, and it could be, this trade can easily be re-engineered in reverse. At the time of publication, Stephen Guilfoyle was Long MU, NVDA, INTC equity, Short MU, NVDA calls, Short MU, NVDA puts.